It doesn't happen often, sometimes with variable stars or new novae, but today I get to scoop the IAU before it puts out a circular. Minerva was discovered on August 24, 1867 and named after Minerva, the Roman goddess of wisdom. It is a large main belt, C Type asteroid (carbonaceous asteroids). This type of asteroid has very similar spectra to carbonaceous chondrite meteorites. This chemical composition is approximately the same as the Sun and the primitive solar nebula, except that they do not contain hydrogen, helium and other volatiles. C-type asteroids have extremely dark albedos, so even the largest ones require a telescope to view them. The story of the discovery of Minerva's two companions was actually a matter of some luck. The astronomers (F. Marchis, B. Macomber, J. Berthier, F. Vachier, J.P. Emery) using the Keck Adaptive Optics system found they had extra time in their observing program because the slewing and imaging of the telescope was more efficient than they had anticipated. Even though their observing program was to look for binary S-type asteroids (which have brighter albedos) they decided to look at a few large C-type asteroids, not previously observed with adaptive optics, to fill in their observing run. 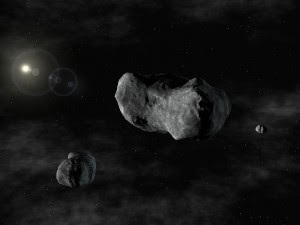 The high resolution images provided by the Keck AO system revealed that asteroid 93 Minerva has 2 tiny km-sized moons in orbit around the large 140-km primary. The two moons are 4 and 3 km in size and orbit the primary some 630 km and 380 km away respectively. There are not many known triple asteroids. We know that (87) Sylvia (45) Eugenia and (216) Kleopatra each possess two moonlets. These were all discovered by the same team that discovered (93) Minerva's satellites. There are two triple asteroids in the Near-Earth Asteroids and 2 more (including Pluto) in the TransNeptunian Object population. And that is where the count stands as of today. So why do we care about binary or triple asteroids? Astronomers anticipate finding clues to their formation and evolution, as well as conditions in the early solar system. 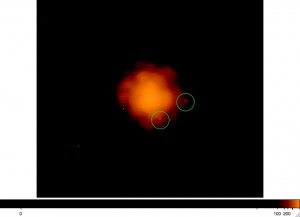 For example, an article published in Nature (Aug 2005), claims the 87 Sylvia triple system was most probably formed through the disruptive collision of a parent asteroid. The new primary formed from accretion of fragments, while the moonlets formed from the debris. These asteroids can teach us about the violent collisions and processes that made our solar system what it is today. Pluto is actually a quadruple system--the only one known so far?